You may think it’s weird but one of the things I love most about my home is my farmhouse kitchen windows. They’re extremely difficult to photograph because it seems like light is always pouring through them. So today when I woke up early, I thought I might be able to snap a few pics and capture their detail. Even at 6:30 in the morning there’s still a lot of light coming in, but at least you can see there are lace curtain valances and window panes. I love this little trio of windows above the kitchen sink. I can stand here while washing dishes and look outside. When I first stepped inside this kitchen, I was smitten with these windows so much that I didn’t even care there was no dishwasher! I actually enjoy washing dishes by hand. The ledge running along the bottom of my farmhouse kitchen windows provides an ideal spot for flowers, herbs, or even setting some tomatoes from the store to help them ripen faster. You can see how the photo starts to get blown out near the window as the sun comes up. 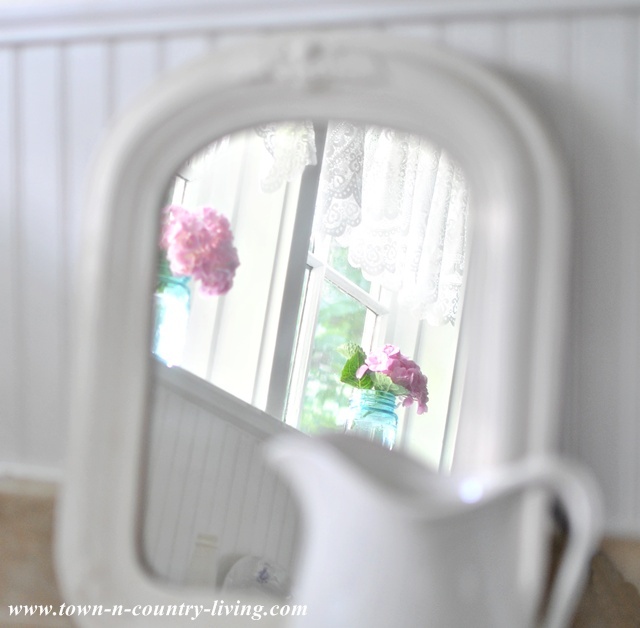 In the mirror you can see a little more of the detailing of my farmhouse kitchen windows. I’ve never seen a trio of windows like this in a kitchen, have you? They’re one of the many reasons I fell in love with this house. The pink hydrangeas were cut from a few bushes we recently planted in the yard. I was debating between pink or blue hydrangeas and hubby said “Get the pink.” I was flabbergasted he wanted the pink but was happy to honor his choice. I’ll keep practicing to get good photos of my farmhouse kitchen windows. If you have any photography tips for this issue, you can let me know in the comments below or send me a message via the Contact Me form. 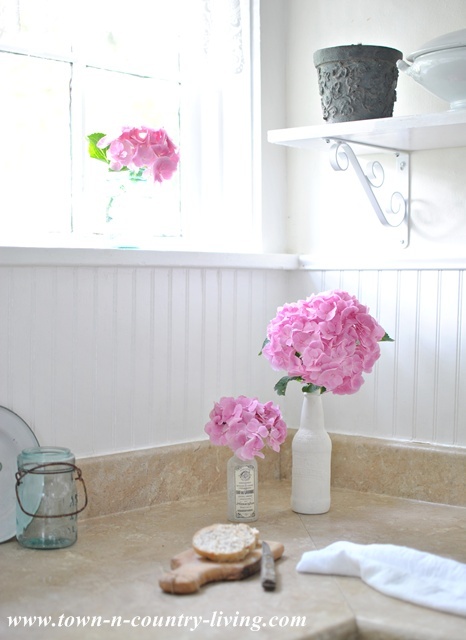 Hope you enjoyed the pink hydrangeas … I’m enamored with them! Before you go … I’m co-hosting a Summer Inspiration Decor linky party this Friday! Be sure to stop back on Friday, June 21st and link up your Summer Inspiration Decor. One Party – Four Blogs!! Your windows look so pretty. The curtains are so very cute and I love your Hydrangeas and the jars they’re in! 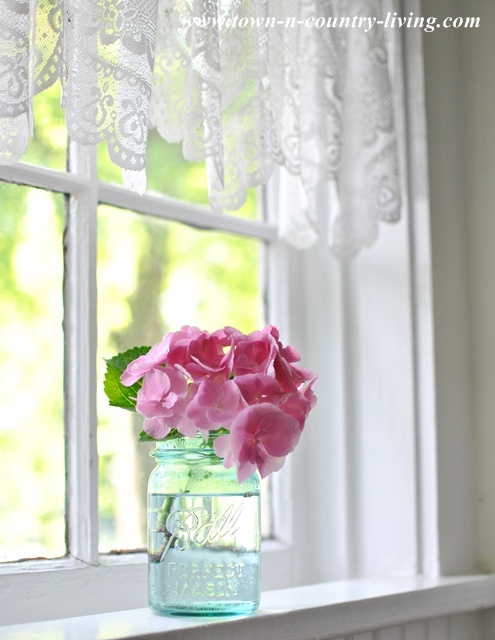 It is a beautiful spot and I always enjoy seeing how you have your window sill decorated. Well, I can see why you love those sweet windows, Jennifer! They add so much personality and “cute factor” to your kitchen! 🙂 I love the way you added the aqua mason jars with hydrangea on the sills. It makes for such a beautiful photo!!! You’ve got just the sweetest kitchen ever!!! Sigh… I cans see why you are in luv with them. I miss my window over the sink… at the old house it over looked the back garden and the boys play area.I luved it as well. In this home, the sink faces the family room 🙂 Like it as well, just not as much. The breakfast nook has a bay that faces the back garden. I don’t think I could have a home without a window above the sink. A sun filled kitchen like yours is so warming to the heart of a home. Your hydrangea’s look beautiful. Your windows are great, especially with the window sill large enough to hold things. So many new homes do not have any window sills at all. Hydrangeas are one of my favorite flowers, and I loved seeing yours. Jennifer your windows are beautiful. I love how the light streams in through them too. So so pretty. But I love yours – and that you have 3 of them!!! p.s. your hydrangeas are gorgeous! I adore your kitchen and the windows ! I have one large window over my sink and I have the same issue with photographing it. I think that building a house without a window over the sink is just outrageous. It must have been thought up by men who never wash or cook. Outside my window I see deer and even the occasional bear. Oh do I love your hydrangeas too…can’t wait to have blooms. Fabulous! I have no kitchen windows in the condo we downsized to. Sooo I hung my fav old paned window over the sink to give the appearance of a kitchen window. I sure do miss a nice sunny window sill to line my fresh tomatoes on. Having three like you have would have sold me on the house too! Stop by to visit us sometime – we’d love to have you visit! I have always loved your kitchen windows, Jennifer. 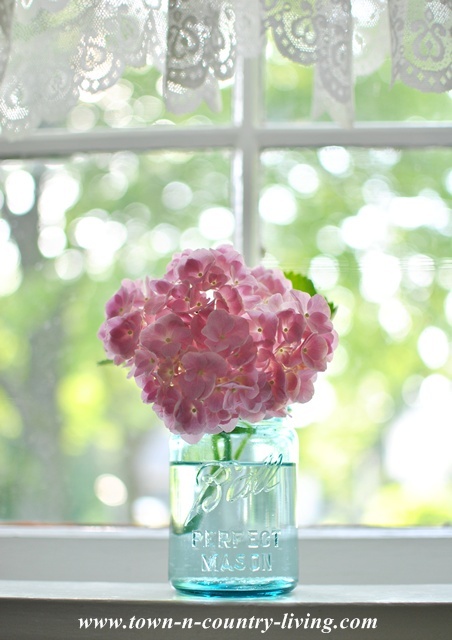 I love the deep window sills also – your hydrangea look so pretty sitting on them. One of the reasons I love my kitchen is that it has a lot of windows and I can see out everywhere. In our previous home, the window over the sink stared right into the side of another house – hated that! I would be in my element to sit on your stool (hold the vase/jug to try be inconspicuous of course!) and just stare, I’m loving your kitchen and especially your windows! When I lived in the states for a little while my house had a very similar window, it was fun to change it up and try different things than the ones we have here in the uk! What’s not to love? You have dressed them so beautifully. And they do everything for your kitchen! ( I hand wash dishes too.) Love your pretty kitchen. 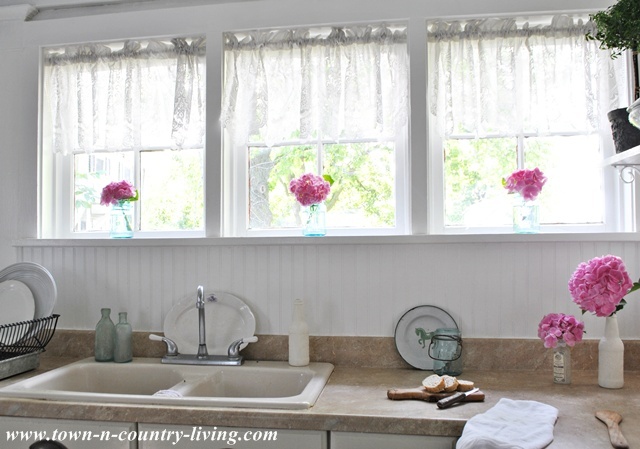 Those little windows are so perfect for your country kitchen. Easy to see why you fell in love with them! I always love seeing your home it is so warm and inviting!! Those windows are so perfect for flowers and herbs! Love the way you have it displayed. I would love for you to become a follower on Cloches and Lavender on my blog and Facebook. We are moving and are going to build a new home and would love you to take the journey with us and give feedback! Oh, your windows are so pretty and I can certainly understand why you love them so! I really like the lace you’ve added too Your kitchen is so pretty. A lovely spot! The color of hydrangeas, though, depends on your soil, which depends on which part of the country you live in. In New England, where the underlying rock is granite and the soil is acidic, hydrangeas will be blue, whatever color they were when you planted them. In the midwest and I think the south, where the underlying rock is limestone, hydrangeas will be pink. I hope you’ll get what you want, though all of them are beautiful. Let the light shine in just like it does in your lovely kitchen. . Have you ever walked into someones house and they have every blind and drape pulled closed. I know it is suppose to save on cooling the house but I just couldn’t live like that. No mole people here. Give me light and lots of it! They are definitely a feature of your beautiful kitchen Jennifer. I too have a very bright and sunny kitchen, which makes it the heart of our home. I love every single thing about your house! And those windows are so perfect. I keep going back to your pictures and posts over and over again. Love love love!!! Love your windows! 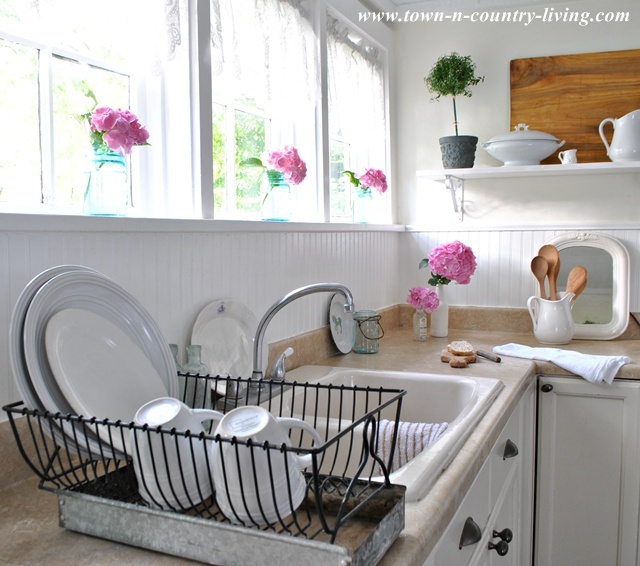 I only have one window over my kitchen sink – and no window ledge either. So you have a bonus! 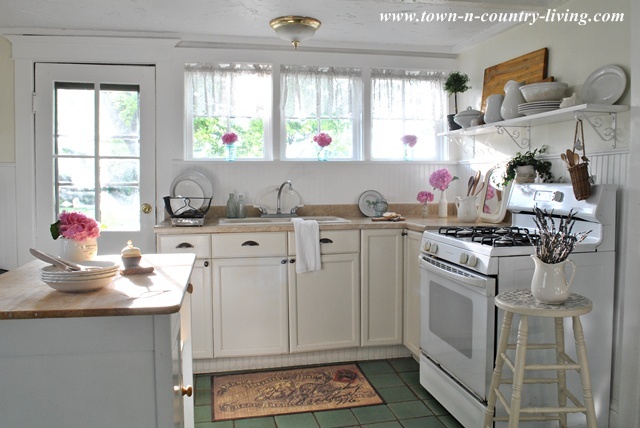 Of all the kitchens in blogland… I adore yours! It’s the perfect farm-house kitchen in my mind. You’ve done a great job! The windows are charming, as is the whole room! Your kitchen is wonderful…I also love your windows and the bead board above your counters. It’s “just right” — welcoming and country-looking.